Recipe for Aachener Printen. Delicious German Christmas Cookies! Try Them! 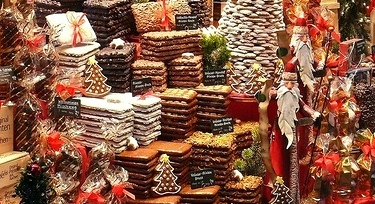 Aachener Printen are a very delicious Christmas cookie made in Germany. They are thick and chewy! My mom is from Germany and my Oma (grandmother) used to mail a great big box of these cookies, German chocolates and other candies every year at Christmas wherever we happened to be. (Christmas was very German at our house). She's no longer with us but I have such great memories of Christmas because no matter where our family happened to be living at any given time (Ecuador, Bolivia, the U.S., wherever...) Oma never failed to send that huge box of Christmas delights! It made every Christmas feel like we were right there in Germany with her. Now I'm going to share the recipe with you (below). I thought it might be cool to try something really different for Christmas this year. You need to prepare the dough 5 days before you bake it (this helps the flavors really pop!). And by the way, they last for months! They become really hard and chewy at the same time, but their flavor only gets better and better with time. They make great gifts! I hope you'll enjoy sharing one of my favorite Christmas traditions and that you'll share your Christmas traditions too. For best results, use a kitchen scale to make these delicate cookies. What's your favorite Christmas recipe? In a saucepan over medium heat, stir together syrup and water until hot. Remove from heat and cool slightly. Dissolve the potash in the rum. Break the rock candy into very small pieces. Add all of the ingredients to a large mixing bowl and knead until dough forms. Wrap in plastic wrap and let dough rest for 5 days in a cool place. Preheat oven to 350 F. Grease baking sheets. On a lightly floured board, roll dough out to 1/4 inch thick and cut out 1-inch by 2-inch rectangles. Place cookies on prepared baking sheets, about 2 inches apart. Bake 15 minutes. Allow to cool for one minute on baking sheet and then remove to wire racks to cool completely. Glaze the cookies with a mixture of one part syrup to one part water. When dry, store in tins at room temperature. ***Potash is potassium carbonate, a chemical leavening which helps baked goods stay moist. It tastes really bad by itself, but when it's baked into cookies the taste goes away. You can buy it in little packets in German stores. If you can't get any, substitute baking soda.